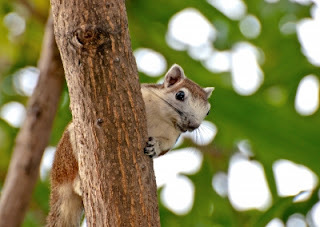 Who wouldn't be charmed by the sight of a small and fuzzy animal as a squirrel? The situation is far less ideal when we realise that this small rodent nests in our house and is leaving visible signs around our home. An infestation could lead to damage to cabling, floor and be the cause of even bigger problems. This case, however, is not uncommon. Due to the abundance of such situations, there are various types of solutions you can pick from. The most vulnerable area is the attic. They often seize the opportunity of an open window and tall trees to access houses. Squirrels create a lot of noise and they are prone to harm wires and create problems with the electricity. After they have already nested into your home, make sure to drive all of them out of the loft before making the area squirrel-proof. Since bird feeders are particularly vulnerable to squirrel activity, many seek different options to prevent them from eating the birds' nourishment. One of the best solutions is to use bird food that contains inert materials that are undesirable for the rodents. Gardens might attract squirrels as well, but there are certain precautions that you can take. A simple garden wire mesh placed on the ground can protect the pants from being harmed, while not restricting their growth. Since both cats and dogs are a risk to squirrels, the areas that pets are present in are less frequented by these rodents. This suggests that pets might aid the prevention of squirrels nesting in a home. However, this is only effective on the ground; our pets might not be able to harm a squirrel once there are trees accessible to it. There have been cases where large numbers of squirrels attacked their predators from trees. Nevertheless, there are various ways in which you can make a tree inaccessible for squirrels. Placing a protecting cylinder around the trunk is an effective method. It is, however, crucial to place it sufficiently deep, so the rodent cannot make its way under it to the other side. A flashing made of metal can also be installed around developed trees at 60 cm (2 feet) of height. There are two things to know before placing protective barriers. First, they need to be placed on every tree around your garden that a squirrel might leap from. Second, if you are in a region with a lot of snowfall, place the barriers above the snow, because the squirrels can use it to jump over the restrictors. Note that squirrels can jump vertically up to 5 meters (16 feet), and they can also safely fall down from a distance of about 8 meters (27 feet). Because of this, you also have to prune all the hanging branches. Getting rid of squirrels is a very complicated job. In some cases, it might include trapping and even extermination the animals. So, before taking matter into your own hands ask a contact a specialist. Professionals have all the required knowledge to carry out the job safely, humanely and according to the animal laws.